These tires aren't just being tortured, they're being atomized. We haven’t seen much of the new Bentley Flying Spur, but boy when it’s out-and-about, it’s something to see. We say that because this new spy video doesn’t just capture the big, stately sedan cruising sedately around town. Some of this footage comes from the Nürburgring, and let’s just say the driver has absolutely zero concerns about tire wear. It’s quite common to see automakers pushing cars hard at the track, but we don’t often see prototypes dabbling with opposite lock, never mind one as big as this. We are actually seeing a couple different cars here, and one could be a plug-in hybrid. Listen to the car early on in the video with the number plate ending in OYM – it passes the camera with a distinct whine that sounds like an electric motor to us. Meanwhile, the black Bentley wearing the number play DGI7 VHV has a clear exhaust note, and the driver isn’t afraid to dip into the throttle for a quick getaway from the camera. We know a hybrid model is coming that should pair a V6 engine with an electric motor. Bentley buyers looking for traditional power should be able to choose from V8 or W12 engine options, but regardless of the powertrain, the big sedan should be gutsy. Indeed, it appears the more aggressive of the two prototypes in this spy video is the hybrid, as that’s the car we see getting a bit sideways under power. The new Flying Spur is expected to be Bentley’s swan song before changing up the business model to go far deeper into the electric realm. 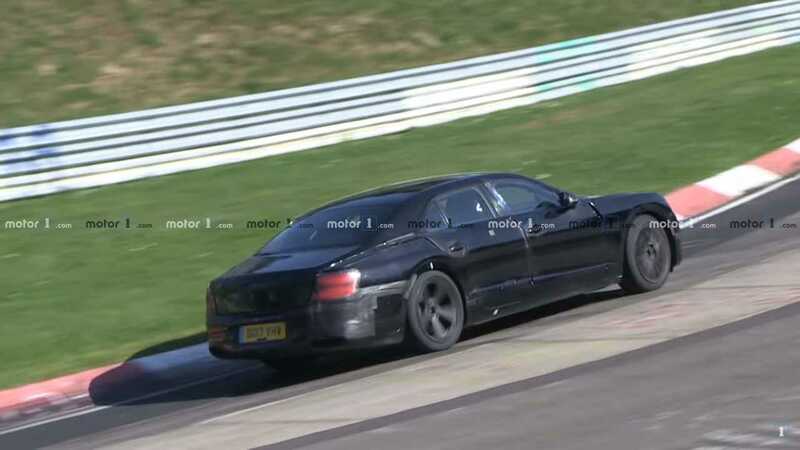 Prototypes have been testing for some time now, and we expect to see the standard model revealed sometime in the first half of 2019, followed by the hybrid later in the year as a 2020 model.